Standard Recording Company, an independent record label based out of Indianapolis, sure has come a long way since its creation in late 2001. Mark Latta, who runs and owns the label, says, "I had always wanted to do something like this." It sure is something. A little over five years and numerous releases later, the label has a roster of nine artists who all reside and were discovered right here in Indiana. The early days of the label actually took place in Kokomo, where Latta says there were lots of "rural artists recording in their bedrooms on 4-track." The first release from Standard was a compilation of those artists, which helped to get the sound out to other people and at the same time benefit Habitat for Humanity. The compilation sold well and brought the label and the artists involved some pretty good attention. After the label started to garner some word of mouth publicity, the roster grew and the bands all started to become aware of one another and according to Latta, "It became a close knit group of friends." The label and the musicians involved give off a vibe reminiscent of Elephant Six, but more in the general vibe of good friendship and camaraderie. There's no Robert Schneider masterminding as kingpin in this bunch. Just a healthy sense of friendship and community. When asked if there were any intentions to model the label after an existing label, Matta says, "As far as labels that we admire, Jagjaguwar or Secretly Canadian would definitely be way up there on that list. When [the bands] were all getting their start, it had that similar feel. It wasn't intentional, it kind of developed. The artists that we are working with now have all played together for some time and they all know each other." This year will hopefully see some growth for the label. That is the hope at this point. According to Latta, last year the label had eight releases and this year they hope to have ten. Considering that big league indie label Barsuk Records released nine albums last year, that's nothing to sneeze at. Latta says, "We're trying to expand right now. Right now we are talking to artists out of the area. Some artists in other states. So the goal is to go a little more regional, maybe even national. Our releases are distributed through Nail, which is owned by Allegro. They can be found in independent record stores and we work with Luna and Indy CD & Vinyl. Mostly stores in Indiana and Chicago, beyond that independent chains." Now the label has set up a showcase here in town and it will feature Arrah and the Ferns, BIGBIGcar and Everthus the Deadbeats. 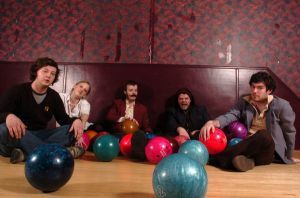 They will be joined by local faves All Nite Skate at the Brass Rail on January 27th. The show starts at 8 p.m. and will only cost you a measly $5. If you are not old enough to enter the bar, don't despair. Arrah and the Ferns will be playing at 2 p.m. that afternoon at Wooden Nickel Records on North Anthony. People of all ages should make their way to Convolution Records on Wells Street to pick up the latest releases from Standard Recording Company bands. You can find Arrah and the Ferns' album, Evan is a Vegan, BIGBIGcar's Limestone Throne/Kid Fight and Everthus the Deadbeats' Addicts Stuck in Traffic there. If you can't manage to get over that way or if they end up being sold out, I can tell you that I hear a very early Rilo Kiley sound in the music of Arrah and the Ferns, only with banjo! Arrah Fisher sings and plays guitar, Wurlitzer and banjolin, Carl Stovner sings and plays guitar and banjolin and Dave Segedy plays drums and miscellaneous percussion. BIGBIGcar will give you a migraine trying to describe their sound. It's simply best to sit back and enjoy. In spite of this, The Faint and Okkervil River both seem to have been influences on David "Moose" Adamson, Jeff "2K" Costello, Pat "Ostry" Okerson and Andy "Peecan" Young. Their album is described in the liner notes as being, 'about a shy boy with a girl name', but then goes on say 'if you think it is about something else, then you are right'. You now have more than enough reason to have this album in your collection. When John Muylle (lead vocals and keyboards), Daniel Fahrner (drums), Lisa Berlin (keys and vocals), Benny Sanders (bass) and Allen Bannister (guitar and vocals) of Everthus the Deadbeats recorded their album they probably never imagined someone would describe it as Psychedelic Furs playing the soundtrack to your favorite David Lynch film. But that's what it sounds like to these ears and that's why the album will be playing for the rest of this year or until my roommate gets tired of hearing it. Whichever comes first. Latta says that if this show is successful, Standard will have more showcases here in town and that means that the next line-up could include This Story, More Animals of the Artic or Everything Now! The only sure fire way to make that happen is to show up on the 27th and bring along enough cash to buy some merch and at least one friend that thinks BIGBIGcar is that band that the guy in Fastball used to be in. 30 people	reviwed this story with an average rating of 4.7.